Michigan Works! and Talent 2025 have joined forces to launch HireReach, an initiative based on Mercy Health’s recent successes in revolutionizing its hiring practices. Mercy Health fills 3,200 positions per year, including 2,100 external hires. When the healthcare system developed an Evidence Based Selection Process (EBSP), the goal was to reduce turnover and improve job performance. After its launch in 2010, the EBSP strategy successfully accomplished those goals, in part, by eliminating biases that traditionally hamper the hiring process. With these biases out of the way, Mercy Health also reached another of its hiring goal by surprise: increased diversity. According to HireReach project manager Rachel Cleveland, Mercy Health hired nearly twice as many people of color as it had in years past. Cleveland agrees that the data shows that lessening personal biases helped to diminish the impact that racism played in the hiring process. Other data reflecting decreased turnover, improved customer satisfaction, and improved employee morale could be interpreted as showing racial discrimination is simply not good for business. Mercy Health developed the EBSP to “complement the skills and experience of talented recruiters and hiring managers with data-driven methods and analysis.” EBSP evaluates candidates’ skills, knowledge, and abilities while eliminating unconscious bias by removing markers like names and appearance from most of the selection process. By organizing open positions into job families with specific competencies, the process screens candidates’ cognitive and character features before they interview. This reduces reliance on personal impressions, which often reflect unconscious bias. While providing employers the benefits of a more diverse workforce, reduced turnover, improved performance, boosted employee morale, and increased customer satisfaction, EBSP also benefits job seekers and new hires because they are happier doing a job that fits their skill-set and personality traits. 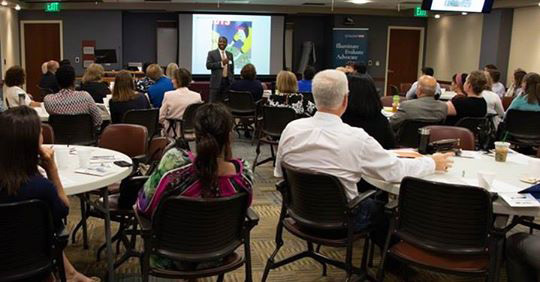 To introduce West Michigan employers to the EBSP initiative, HireReach is hosting four Employer Awareness Workshops: August 22 at Herman Miller in Zeeland; September 12 in Spring Lake; October 3 at ADAC Automotive in Muskegon; and October 31 at Mercy Health St. Mary’s in Grand Rapids. The free, three-hour workshops will provide an EBSP overview, an introduction to HireReach, a panel discussion with Mercy Health, and structured table discussions to help participants plan next steps. For information, email Rachel Cleveland or Whitney White at info@hirereach.org. Photos Courtesy Talent 2025, West Michigan Works!